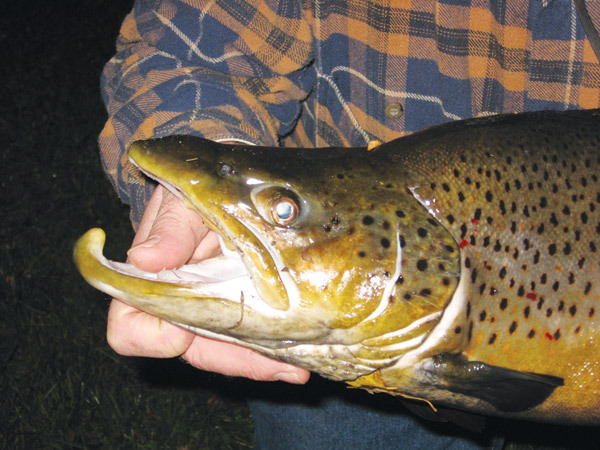 In the fall of the year, when mature brown trout move from their deep-lake summer homes into the spawning streams, a fishless or nearly fishless stream can overnight turn into a flow that’s full of big, bruising brown trout. Sometimes it seems a bit like a magic act. One key is dropping water temperature. It does not need to fall to a specific level (though 55 degrees is something of a benchmark). Just the fact the water is cooling, coupled with the decreasing daylight that also comes with the season, can be enough. But what really gets the trout going is an increase in stream flow. It can come with a release from a dam, but most places, rain is the ticket. Brown trout anglers study the skies and the weather forecast. When a 1-inch soaker hits, they make ready. When the stream is again clear enough to fish, it’s game on. I got a call from Dave Eckhardt, a water specialist with the U.S. Geologic Survey, and he told me the time was coming. After watching the weather forecast, he predicted that Fall Creek, a tributary of Cayuga Lake just outside Ithaca, New York, would be prime in two or three days. In addition to brown trout, the short, 1-mile section of Fall Creek below the towering falls is visited by rainbows and landlocked salmon. For those who don’t have a friend in the USGS, there’s the Weather Channel and also the USGS website, where gauges on streams let you remotely follow water levels and see when a stream is rising or falling. I suggest you also contact a tackle shop in the area, if you’re planning to fish a distant stream, and ask their advice on what water levels produce the best fishing. Some levels are better for wading while others are best for drift boats. With that knowledge, you can mark your calendar, so to speak. In addition, most state fish and wildlife agencies post a weekly fishing report on their web pages, and these typically note how the spawning run is proceeding. Only problem here is the reports are usually updated weekly, and if you wait for the good word, you could be a Johnny Come Lately. Best is the near-instant data on the USGS web page, plus your own reading of the weather forecast. Tackle shop web pages and blogs also can be a source of local information, to some degree, but I prefer a phone conversation with someone in the know. Following Eckhardt’s advice, I arrived about 36 hours after the Finger Lake region received a much needed inch or more of rain. Cayuga Lake is surrounded by farm land, and there can be a considerable amount of cloudy run-off, as was the case with this rain. But by the afternoon I arrived, Fall Creek was beginning to clear, and when we hit the water bright and early the following morning, it was close to crystal. With all of this in our favor, it was time to fish. But first, it’s vital to know and follow not only state regulations but also any special regulations for a particular stream. Even though two streams may be tributaries for the same lake, one may close earlier than the other. One may be limited to catch-and-release; the other may permit only fly-fishing or manage the best waters under fly-fishing regulations. When we fished Fall Creek, nearby Salmon Creek was already closed for the season. Soon Fall Creek would become catch-and-release for several weeks. Though Fall Creek permits both fly and spin fishing, we chose fly rods. In my book, it is the right tool for this job, much like a Phillips screwdriver is best for a Phillips head screw. With a fly rod, I can present a small offering precisely, in a light and easy manner. The one that works best in this situation consists of a nymph, nymphs, or an egg fly and a yarn strike indicator. Again, check the regulations. In some waters only a single fly is permitted, and there may be weight restrictions on that fly. The rules may not permit additional weight to hang below the fly but allow you to put a split shot on above it. Some states require non-toxic weight; lead is prohibited. It gets confusing, I know, but these laws are in place to prevent either the deliberate snagging of spawning fish or to stem the lead poisoning of wildlife, and it is your responsibility to known and follow the letter of the law. On the Finger Lakes, a single fly, non-toxic split shot, and a yarn indicator are permitted. Elsewhere, I might prefer a two-fly rig consisting of a beadhead nymph, an egg fly, and the yarn indicator. An important component with either the single- or two-fly rig is the leader. A standard nine-foot 4X or 5X leader can be used. However, I cut and re-splice the leader every 12 to 14 inches in order to have additional knots in the line. Yes, I want knots in the line, heavy connections made by a blood knot or a double surgeon loop. Why? Because I need line stops to prevent the split shot and the yarn indicator sliding down the line. I frequently adjust the placement of these items, particularly the indicator. Yarn indicators are made with O-rings that connect to the line with a U-loop. The strategically spaced knots let me quickly reset the indicator at different levels, and it won’t slide. The first knot is about 8 inches above the fly, because this is where I want the shot. After that, I splice every 12 to 14 inches all of the way to the top of the leader. To avoid tangling, I don’t so much cast as lob the sectioned leader. A slow back cast with the leader pulled taut and allowed to nearly touch the water behind, followed by a slow lobbing lift for the forward cast, will even throw a precious few feet of added line on the forward cast. But the lob I use most is a sort of backhand cast over my opposite shoulder. With the rod in my right hand, I flip the line out slightly ahead of me, perpendicular to the current; then I lift the rod, crossing my chest and bringing the tip over my opposite shoulder. It ends with a forward flip of the rod, still across my body, and the line rolls out ahead of me to my right. When the downstream flow is from my right to left, this puts the fly, weight and indicator upstream, giving the fly time to sink as it approaches the targeted water. As the indicator approaches, I lift the rod to get a nearly vertical line from the rod tip to the water. As it passes, I lower the rod and follow the line with the tip. A single, short, false cast first to my right and then across my body sends the fly back upstream. If I’m fishing a good hole, I may perform this act dozens of times before moving. I want to cover every inch of water, and I want to cover it repeatedly. Many times, I’ve had a fly whacked by a big brown trout when it drifted just a tiny bit away from a previous drift. To set the hook, you pull the rod in the opposite direction of the drifting indicator. In other words, if the strike occurs when the indicator is upstream, pull the rod downstream, and pull it hard. If the indicator has drifted below you and is floating away when the strike occurs, pull hard upstream. While fishing, I constantly, and I mean constantly, remind myself which way to pull should a strike occur at that instant. I believe this attention to detail has helped me catch many a fine fish. Spin-fishing anglers are more likely to fish egg sacks or even night crawlers. Molly Lees fishes a Great Lake tributary where the majority of anglers work natural egg sacks. She baits up with night crawlers, and because she is not as tall and cannot wade as deep as most of her competition, she fishes them with an 11-foot spinning rod. “Guys tell me all about their egg sacks, what color is working, how they cured them and how much time they spent making them,” Lees said. Lees flips a stick float slightly upstream and watches it like a hawk as it drifts along. She wants to see that the night crawler is bouncing along the bottom. No matter whether you fly-fish, bait up with an egg sack or worm, migrating brown trout are a premier target for the fall. None of these fish are small.